Walter Brunner, pictured here in front with light gray jacket, was recognized by local and state officials as the “best ambassadors and promoters of German-American friendship.” Brig. Gen. Christopher G. Cavoli of the 7th Army Joint Multinational Training Command, Col. Mark. A. and Mrs. Colbrook, Command Sgt. 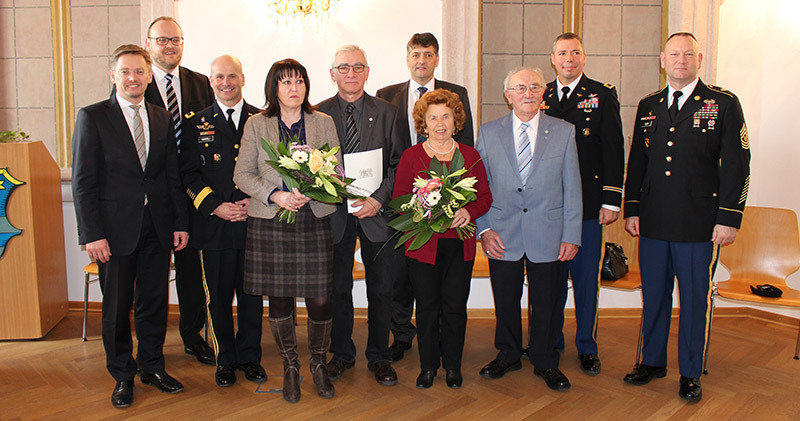 Maj. Robert G. and Mrs. Todd of U.S. Army Garrison Bavaria, City of Grafenwoehr Mayor Edgar Knobloch and members of and Bavarian state parliament Petra Dettenhöfer, Annette Karl and Tobias Reiss were among the congratulates. GRAFENWOEHR, Germany — The president of the KONTACT Club here was recognized March 4 by local and state officials for his accomplishments in promoting German-American friendship over the past 25 years. The county commissioner of Neustadt County, Andreas Meier, presented the “Honorary Dedication of the Bavarian Minister President for Special Accomplishments” to Walter Brunner, the president of the German-American KONTAKT Club at Grafenwoehr, at a festive recognition ceremony, held in the historical chapel inside the Neustadt County Office. Walter Brunner, who is with the Grafenwoehr German-American KONTAKT Club for almost 25 years, has served as its German president for 21 years. During his tenure, Brunner — supported by his spouse Anni — touched the lives of countless U.S. Soldiers and civilians and established, maintained and promoted numerous German-American relation events at all levels. “It always was and still is his very special heartfelt desire to integrate German and American members of the KONTAKT club also into the Grafenwoehr city events,” said Grafenwoehr’s mayor Edgar Knobloch.